Gamers wanting an excellent compact mechanical keyboard for $80 should look no further than the K63. If there’s one thing PC gamers demand, it’s a high-quality input device loaded with features and performance for an affordable price. They want a peripheral with customizable options to not only make the PC gaming experience better, but give their desktop a dash of visual flare. There’s also a growing demand for compact solutions to free up desktop space, and that’s where Corsair’s $80 new K63 mechanical keyboard comes in. It faces stiff competition from the likes of Razer, Logitech, Cooler Master, and more, who are gradually filling the compact keyboard space with great products. That said, do customers get their bang for the buck when investing in Corsair’s K63 solution? Let’s find out. 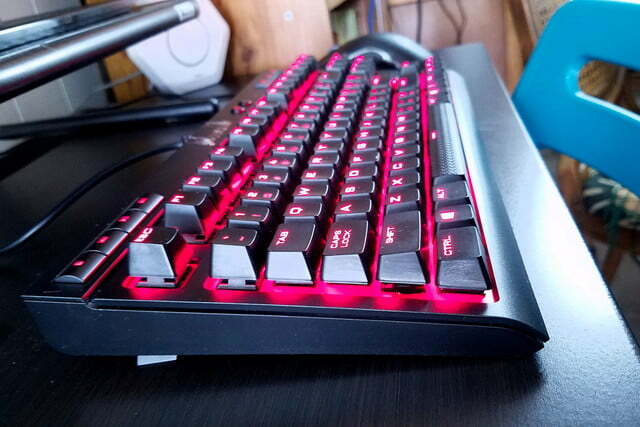 Corsair’s K63 compact mechanical gaming keyboard sports a “tenkeyless” form factor, meaning its shorter in width due to the removal of the numeric keypad. That also means the peripheral is highly portable, although we’re not sure why Corsair doesn’t provide a removable USB cable. It’s permanent, and could lead to connectivity problems after users continually wrap the cord around the keyboard during transportation. The K63 measures 14.37 × 6.73 × 1.61 inches, and weighs 2.46 pounds. There are no dedicated macro keys, or a Function key, but it does include four media keys along the top-left (stop, backward, play/pause, forward), one button for switching through four brightness levels, a Windows Key lock button, and three dedicated audio buttons in the top-right corner (mute, volume down, volume up). The only other notable attribute is the spacebar, which has a unique textured surface. 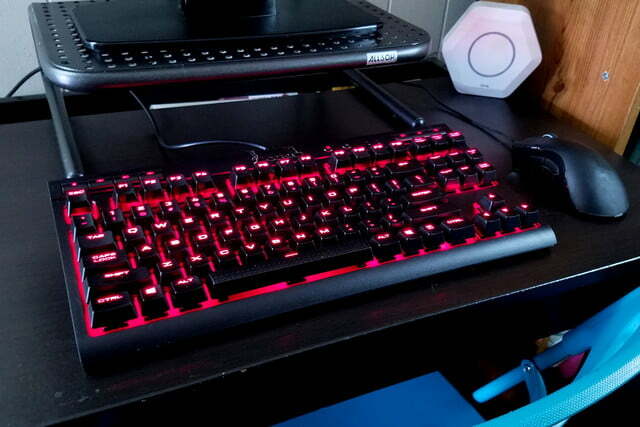 On the illumination front, the K63 provides red per-key illumination. There’s nothing wrong with that, but users wanting a rainbow of flavors dazzling their desktop will need to look elsewhere. Corsair is targeting PC gamers looking for a high-quality, feature-packed compact mechanical keyboard with an affordable, competitive price. Corsair delivers just – and only – that. 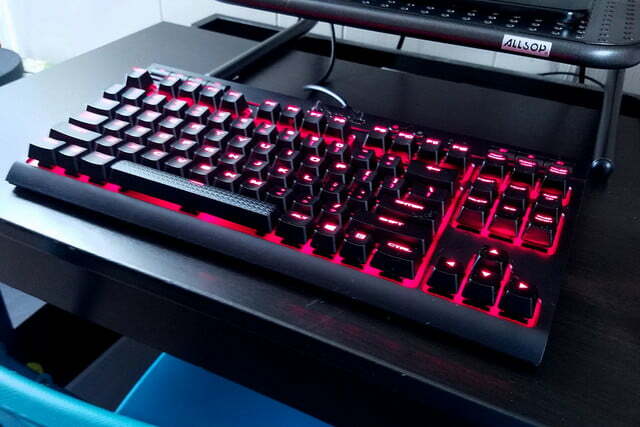 The keyboard relies on Cherry MX Red switches, which have an audible “ding” instead of the annoying “click” heard with mechanical switches used in old mainstream keyboards. In fact, Cherry MX Blue switches provide that sharp audible clicky feedback, although Red switches still aren’t exactly ideal for midnight stealth PC gaming when your significant other is asleep. 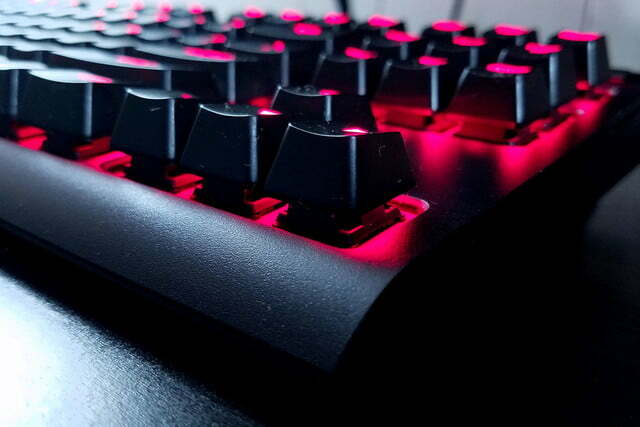 Cherry MX Red switches are typically sold in game-focused mechanical keyboards. 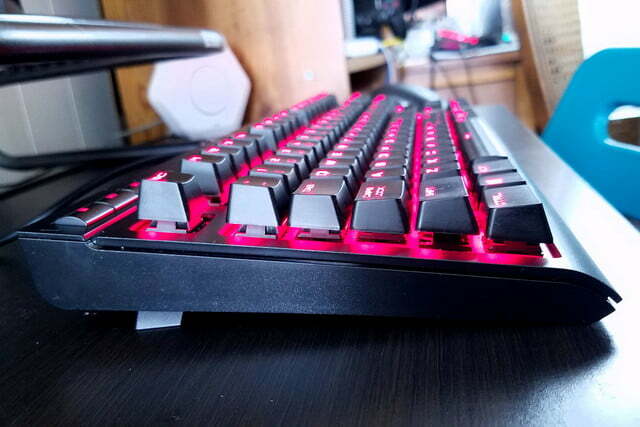 They have an actuation force of 45g, meaning that’s how much force the finger needs to press the keycap to the point of hardware-based keystroke registration. This is due to a soft spring that doesn’t provide any tactile feedback until the switch is pressed all the way down, providing a smooth descent between keypress and actuation. That “cN” symbol is short for centinewton, which is another way to measure the amount of force required to press a key. The lower the number, the less force is required to actuate the keystroke. PC gamers want their commands to respond quickly, but don’t want the method to feel mushy, semi-quiet, and too fast. Typically, the number is associated to gram-force (g), but the use of “cN” and “g” largely depends on the switch manufacturer. Thus, because Corsair’s new keyboard uses Cherry MX Red switches, typing and PC gaming feels extremely solid. The audible aspect really depends on the end-user. Some may love the super-loud typewriter-style clicking, and some may prefer a semi-soft ding to serve as an audible acknowledgement for each keystroke. The keys provide enough “bounce,” for a firm feeling that seemingly resets instantly. The company’s Corsair Utility Engine (CUE) software is where the customization magic takes place. Users can create custom profiles that will load with a specific game, setting up pre-determined key illumination, lighting effects, event assignments, key remapping, and more. The software also falls back on a “default” profile users can modify to make everyday tasks much easier too. 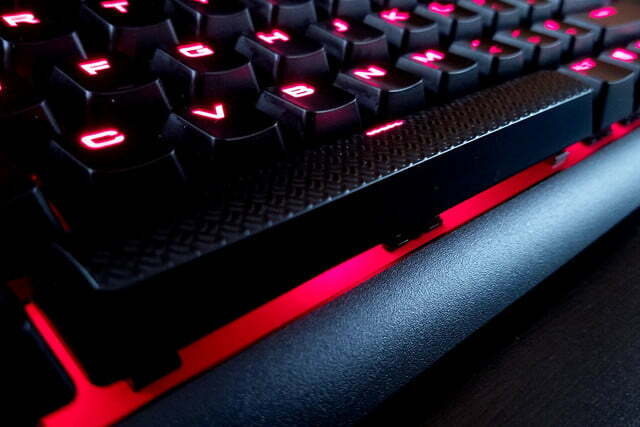 Corsair’s K63 is great for PC gamers who want performance, but not a whole lot of flair. As an example, we created a custom profile for DOOM (2016). This is done by clicking on the “+” button next to the “Default” configuration listing. User can assign a name to the profile, link it to a specific executable (DOOMx64.exe in the case of DOOM), assign a custom profile icon, and assign a background image. The transparency of the tabs can even be lowered so the cool backdrop becomes more visually dominant. Every profile has an “Actions,” “Lighting Effects,” and “Performance” subcategory. That latter section focuses on the Win Lock button, enabling users to disable additional keys when the button is active. For instance, users can choose to also disable ALT + Tab, ALT + F4, and SHIFT + Tab. There’s even an option to disable the Win Lock button LED, or to set its brightness from completely off (0) to completely on (255). The Lighting Effects section is where the fun stuff can be found. For the DOOM profile, we created nine separate lighting effects, because we couldn’t figure out how to assign multiple keys across the keyboard in one specific effect. For instance, we created a “Movement” lighting effect that only illuminated the arrow keys, while another “Rocket” effect lit up the assigned key. We even created a “Background” lighting effect to illuminate the remaining keys not deemed important. The keyboard supports seven visual effects: Visor (think Cylon), Rain, Pulse (think breathing), Wave, Type Lighting (Key), Type Lighting (Ripple), and Static. For our DOOM profile, all lighting effects used a static color save for the “Background” lighting effect. This used the Rain effect, which lights up keys in a rain-like descending, random order. Users can “customize” this effect by reducing or increasing its opacity, and changing the speed between slow, medium, and fast. As for the Type Lighting (Key) effect, the keys will light up at each press, and then extinguish between one to five seconds later, depending on the duration setting. The Type Lighting (Ripple) effect is rather neat, which causes a red ripple effect emitting out from the pressed key. Like the previous effect, this one provides slow/medium/fast speed settings, and a slider for opacity. Users can also mix and match lighting effects, too. For instance, we set two lighting effects for the default profile to create a wild mixture. The “Visor” effect moves back and forth horizontally, but we lowered the opacity to the halfway mark and at a medium speed. The “Rain” effect dropped full red illumination in droplets between the visor scans, with the opacity set to full, and the speed set to medium. It’s just a shame red is the only color available. 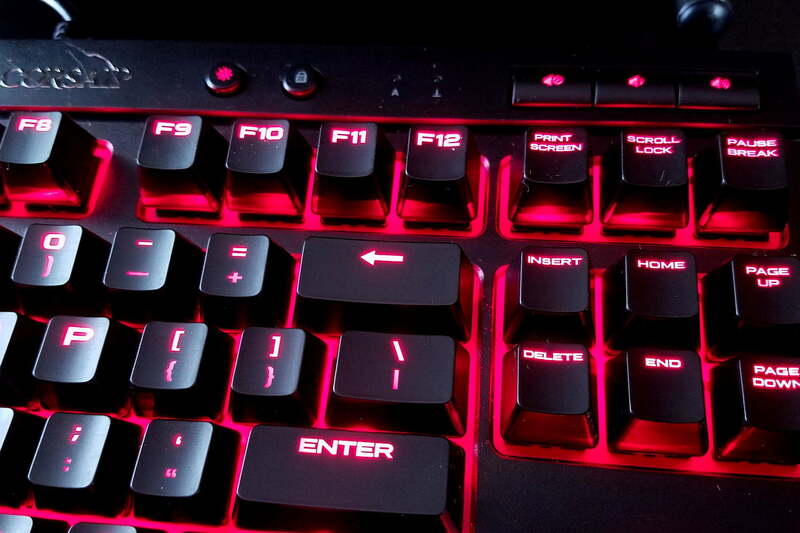 What’s interesting about Corsair’s K63 mechanical keyboard is that game developers can take control of the keyboard’s illumination — if you let them, of course. 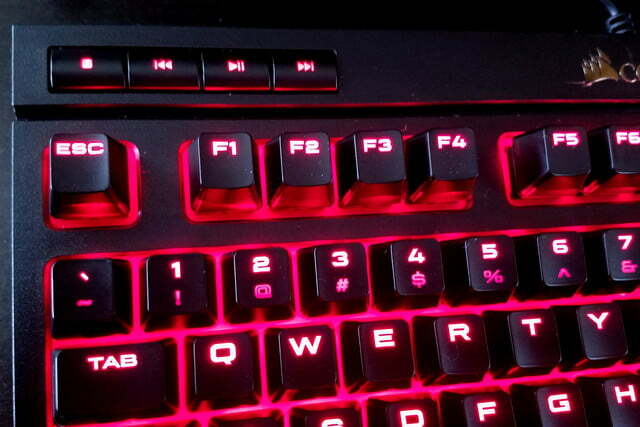 For instance, Epic Games’ Unreal Tournament 4 “Pre-Alpha” has a setting in the System Settings list labeled “Enable Keyboard Lighting.” A note says this feature is only supported by Razer Chrome and Corsair RGB keyboards, but the game has no problems managing the red illumination of Corsair’s new K63 keyboard. Keystrokes feel crisp, responsive, and each press of a button isn’t annoying on an audible level. Once users launch the game, the red illumination goes dark for a moment, then lights up the keyboard in full red brightness, bypassing the user’s default profile. When a match begins, the lighting will go dark for a split second, and then illuminate only the WASD keys and whatever weapon is currently in use. Upon death, the lighting blacks out again until the player spawns back into the current match. The user’s default profile then reloads after exiting the game. For the life of us, we couldn’t figure out how to edit the keyboard illumination on the game side, and Epic Games didn’t respond to our questions. To get around the automatic lighting configuration, users must toggle off the in-game keyboard lighting support and create a profile in the CUE software. If you create a profile and leave the in-game keyboard illumination support, Unreal Tournament 4 will override your custom profile. 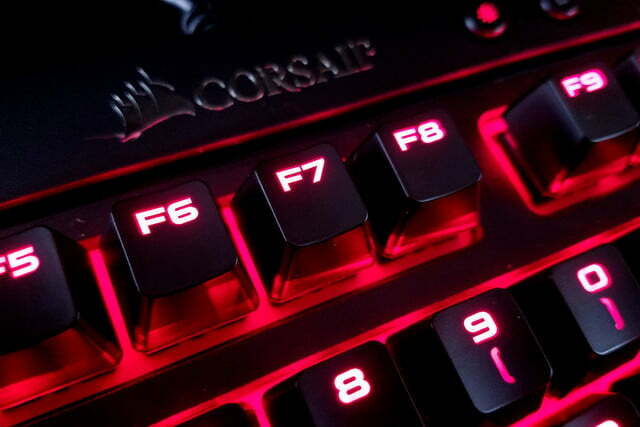 As we previously stated, we love the “feel” of each key in and outside of gaming. The actuations feel crisp, responsive, and each press of a button isn’t overly annoying on an audible level. We’re not exactly use how many keys users can press simultaneously, but our 10-finger test showed that the keyboard registered each pressed key correctly. That backs the company’s 100-percent anti-ghosting claim, which means customers won’t see “ghost” keystrokes inserted into their multi-key commands. The keycaps provided with the K63 model have a nice shape that doesn’t grip the fingertip, but don’t have an edgeless, feel either. All keycaps are super smooth save for the space bar, and sport a thick, squished font like the sans-serif Microgramma Bold Extended type face. The keycaps do not appear to be removable — at least, the puller we used couldn’t remove them. Finally, Corsair states that the keyboard has a report rate of up to one millisecond, which could also be stated as a polling rate of 1,000Hz. That essentially means the keyboard can provide updated data to the host PC every millisecond. The typical non-gaming keyboard provides input info to the host PC every 10 milliseconds. Input lag appeared nonexistent, although it’s admittingly been a long time since we tried to game on a standard mechanical keyboard. All this input lag talk was a major selling point for a similar tenkeyless keyboard provided by Logitech, which also felt tight. If anything, customers can walk away from this info knowing that Corsair’s K63 mechanical keyboard will perform even though it’s not a flashy RGB solution. Corsair provides warranty information on its website. 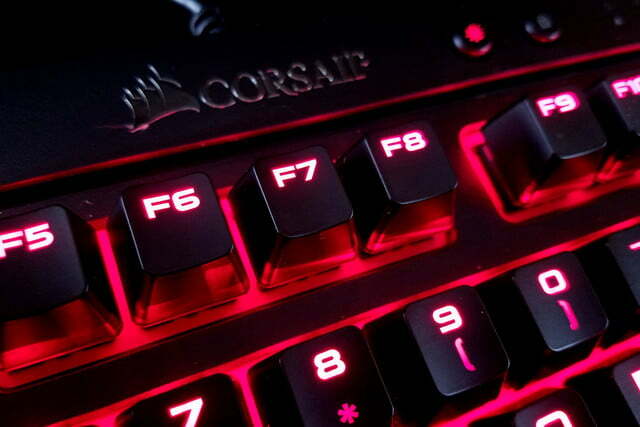 Corsair will cover the keyboard for up to two years after purchase regarding defects in the material and workmanship. In other words, if it doesn’t work as advertised, then Corsair will repair or replace the keyboard, or refund the customer’s money. But don’t wait too long: Corsair will keep 10 percent of that money as a “usage” fee for each year since the date of purchase. Corsair’s new K63 compact mechanical keyboard is a great solution for PC gamers who want performance but not a whole lot of flair. It not only saves space on the desktop, but it seemingly focuses on providing the tools PC gamers need to win. Its compact size also indicates portability, but the keyboard doesn’t ship with a detachable USB cable. If anything, that’s the only real flaw we found. We loved the Logitech G Pro mechanical keyboard sporting the same compact “tenkeyless” size, but it costs $130. Logitech sells its comparable G410 Atlas Spectrum RGB for the same price, but it has a bulkier form factor. The Razer BlackWidow Tournament Edition Stealth ($67) is quite popular, as is the CM Storm QuickFire Rapid ($72). However, these do not quite as many backlighting options. The “tenkeyless” form factor is rather popular its small and portable. This isn’t the only compact keyboard Corsair provides, as the company offers the Vengeance K65 unit with Cherry MX Red switches, no backlighting, and a detachable USB cable. Customers who purchase the K63 likely won’t need to grab another mechanical keyboard for a long time. Customers on the market for an excellent compact mechanical keyboard at $80 should look no further than the K63. It has plenty of customization and performance without the flair, making it a great choice for gamers who prefer go over show.